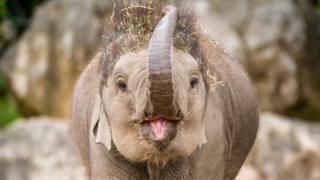 An elephant calf at Chester Zoo has tested positive for a life-threatening virus. Two-year-old Indali Hi Way is being treated for endotheliotropic herpesvirus (EEHV). Two calves died at the zoo last year after falling ill with EEHV, which usually proves to be fatal. Almost all Asian elephants carry the virus but it only develops into an illness for some and there is no vaccination against it. The zoo said it detected the virus "at the earliest possible moment" and added that "no calf has ever had a better chance of surviving than Indali does right now". The virus attacks membranes, rapidly causing fever and bleeding. Chester Zoo's director of animals Mike Jordan said: "Although it was such early stages and Indali looked happy in herself, we couldn't take any risks due to the fast-acting nature of the virus and began treatment immediately." He said experts are treating the calf with blood plasma transfusions and anti-viral medications. "The odds are stacked against us, but we have never been more hopeful," Mr Jordan added. Relatively little is known about the virus, which affects both wild and captive elephants. Conservationists have discovered fatalities among Asian elephants around the world, including in India, Nepal, Thailand, Indonesia and Myanmar. Chester Zoo is part of global efforts to find a vaccine for the disease.